"Ever met a New Belgium Beer Ranger? They are our beloved folks out in the field. Spanning all 26 of our states from the Pacific to the Atlantic, our Beer Rangers do their best to protect, to pour and to partake. And explore many a beer from many a brewery, they do. The fellows up in the Northwest kept calling for more hops! Soon it became a common theme across the land. Rangers, fans and craft lovers everywhere were searching for hoppier beers. Pours a pale yellow hue, settling a light amber color with a chunky white head that leaves tacky lacing in its wake. Brilliant clarity with low carbonation levels. Initially a nice light citrus hop presence dominates the aroma. The hop presence is rather light and toasty. Accompaning the hop presence, there is a subtle eartly yeast presence. The citrus hop was very reminisant of grapefruits. We were very excited by the aroma. Initial taste is light bitter that quickly ramps up, leaving some intense resiny bitterness at the finish with a lengthy dryness. 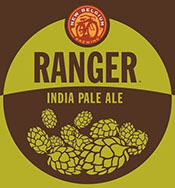 With a light to medium body, the Ranger was impressive from our first sip. With a suprisingly smooth and creamy mouthfeel, the hop body immediately thrashed out palates with a harsh hop feeling. The 6.5% alcohol was not overpowering, but gave us a nice warming feeling. This IPA lives up to our expectations. This IPA was worth the wait from New Belgium. One of the last well-established breweries to introduce its first IPA, Sam Adams being another, I'd be curious to ask why the wait to come to market with such a popular style. Whatever the reasoning, they're still hitting it at the right time and should capitalize well with this brew.